Free Shipping On All Legacy Products! Free Shipping on Wise Food Storage! The Missing Link to Your Food Storage! The Preparedness Seeds Medicinal Garden Bucket has been designed to help people meet their health needs in hard times when the family garden may well become our only resource for home remedies. 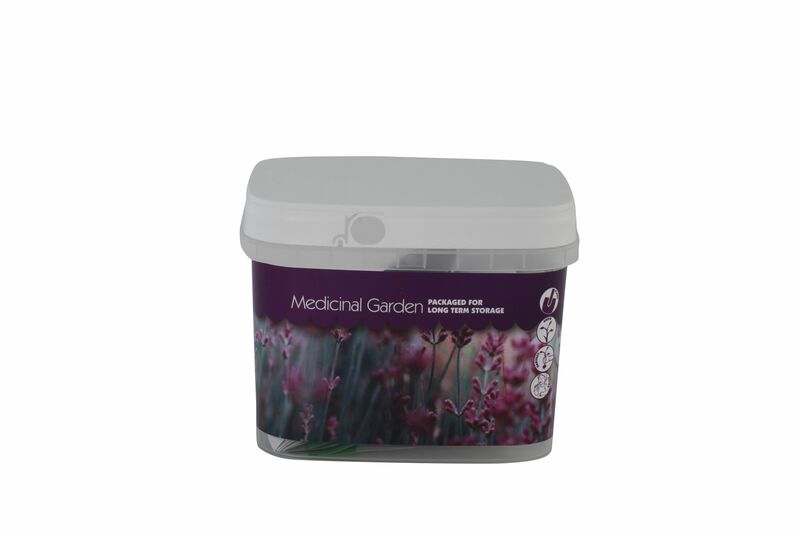 Each Mini-Ropak Bucket contains 10 medicinal herb seed varieties which have been packaged for long term storage. These Seeds are Non-Hybrid, Non-GMO and are not chemically treated. Because they are non-hybrid, seeds may be harvested at the end of the growing season and then used for the next year’s planting. 10 seed packets sealed in a Mini-Ropak Bucket. Plants a large herb garden. Will keep up to 4 years if stored at 66 to 70 degrees and much longer if kept colder. Harvested seeds can be planted year after year. Packets are re-sealable for lasting protection. Each of our Seed varieties comes with a Quick Start Growing Guide. Please Note: Because of the shortage of Non-Hybrid seed, substitutions may occur. For Our Newsletter and Receive Exclusive Deals and Articles!